Scientists might soon get closer to understanding the nature of the Milky Way’s supermassive black hole. To observe its mysterious event horizon, they are connecting a planet-wide system of telescopes that will “see” 1,000 times better than Hubble. Work is underway on creating the global Event Horizon Telescope (EHT), which will become the first-of-a-kind instrument to take detailed pictures of the black hole, known as Sagittarius A-star, the US National Science Foundation reported on Tuesday. 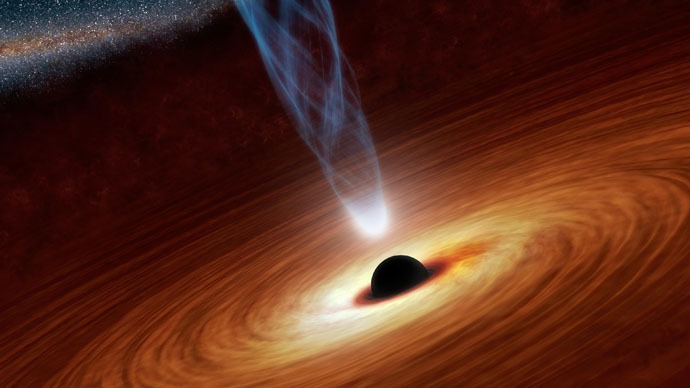 The telescope is destined to prove that black holes do have so-called event horizons – borders, from which even light cannot escape the immense gravity. That is why the black hole itself is most likely to remain invisible – or simply a dark silhouette. But the EHT will make it possible to observe new details, as its resolution will be 1,000 times clearer than the Hubble Telescope. In one of the preliminary experiments, another black hole was observed in Centaurus A galaxy, located 10 million light years away. This was achieved by combining two telescopes – the SPT [South Pole Telescope] at the NSF South Pole research station and the APEX telescope in Chile, located nearly 5,000 miles away from each other. “The baselines to SPT give us two to three times more resolution than our past arrays, which is absolutely crucial to the goals of the EHT. To verify the existence of an event horizon, the ‘edge’ of a black hole, and more generally to test Einstein’s theory of general relativity, we need a very detailed picture of a black hole. With the full EHT, we should be able to do this,” Dan Marrone, an assistant professor in the University of Arizona’s Department of Astronomy and Steward Observatory, said. This week, the 75 feet (23 meter) high South Pole Telescope was connected to the Atacama Pathfinder Experiment, the Large Millimeter Telescope in Mexico, the Submillimeter Telescope in Arizona, the Combined Array for Research in Millimeter-wave Astronomy in California, the Submillimeter Array and James Clerk Maxwell Telescope in Hawaii, and the Institute for Radio Astronomy Millimetrique (IRAM) telescopes in Spain and France. “Now that we’ve done VLBI [Very Long Baseline Interferometry] with the SPT, the Event Horizon Telescope really does span the whole earth, from the Submillimeter Telescope on Mount Graham in Arizona, to California, Hawaii, Chile, Mexico and the South Pole,” he added. Black holes were theoretically postulated by Albert Einstein’s General Theory of Relativity, later to be proved by decades of astronomical observations. Our galaxy, Milky Way is home not only to the supermassive black hole at its core, but also to 25 smaller ones.